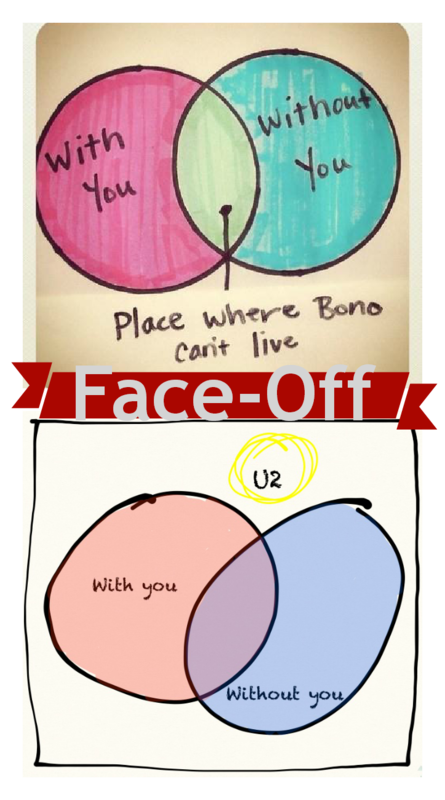 evangelizing the (digital) natives : Face-Off: Which Bono Venn Diagram Is Correct? Have you seen the top Venn diagram on Facebook or Twitter based on the U2 song "With or Without You?" The top diagram is cute, and a good conversation-starter, but I don't know if it's correct. The overlapping area of two or more sets is called the intersection. An intersection would be the subset of both overlapping sets. In common language, an intersection is usually appropriate when "and" is the conjunction between two sets, and a union is appropriate when "or" is the conjunction. It seems to me that the correct placement of Bono depends on where you're choosing to stress your interpretation. Is it in the double-negative spiral of "can't" and "without," or is it as cut and dry as "or and "and"? 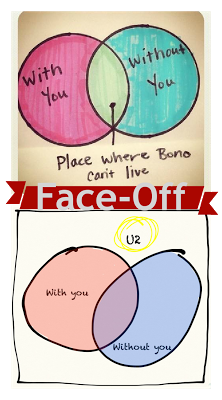 "With or Without You Venn Diagram Meme"
"You, Bono, and a Venn Diagram"